Michigan is the only place in the world with a floating post office. The J.W. Westcott II is the only boat in the world that delivers mail to ships while they are still underway. They have been operating for 125 years. More tonnage passes though the historic Soo Locks in Sault Ste. Marie than the Suez and Panama Canals combined. The ninteen chandeliers in the Capitol in Lansing are one of a kind and designed especially for the building by Tiffany’s of New York. Weighing between eight and nine hundred pounds apiece they are composed of copper, iron, and pewter. The ferry in the resort town of Saugatuck is the only remaining chain-driven ferry in the country and it’s hand propelled. On January 26, 1837, President Andrew Jackson signed the bill that made Michigan the twenty-sixth state. In 1847, the legislature passed a law to locate the state capital in Lansing. Ford began manufacturing the Model T in 1908. The United Automobile Workers of America was organized in Detroit in 1935. In 1959, Detroit gained even more acclaim when Berry Gordy Jr. founded Motown Records and started a legacy that would last forever. In 1974, the state celebrated Gerald R. Ford, the first Michigander to become president. The Gerald R. Ford Presidential Museum was established in Grand Rapids in 1981. 2002 was the year that Jennifer Granholm was elected Michigan’s first female governor. In 2011, Michigan will be the setting for thousands of perfect vacations. Ask anyone who has visited our great state and they will tell you that there is just something about Michigan, something that welcomes you in and pulls you back. It could be the sense of solitude and peace you feel as you look over snow-covered hills and feel an electric chill in the air. Perhaps it is the warm sand between your toes as you lounge on one of Michigan’s several pristine beaches, while hearing the roar of a Great Lake lulling you into deep relaxation. Or the awe you might feel as you traverse the state in fall, taking in the jewel tones of changing leaves and savoring the fresh, crisp air. Michigan is, in a word, magical: a single state that gives visitors the feeling of traveling around the world. In this lovely state, there are over three thousand miles of shoreline, 11,000 inland lakes, and millions of acres of forest cover. There are nearly 10 million residents in the Mitten State, spread out over eighty-three diverse counties. But what Michigan has the most of is…reasons to visit. Our delightful peninsulas are more than just a sum of their lovely parts. Of course, we have access to four of the five Great Lakes and slopes for skiing. 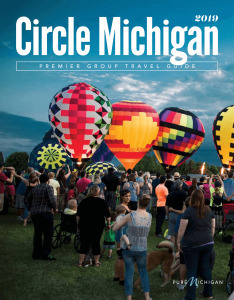 But the heart of Michigan is more than its topography—it’s an attitude, a history, and a lifestyle that make Michigan a special place to visit.